Creativity and usability are topics which are intertwined on the web and are discussed regularly. Both fields are equally important when building a successful product or website, however conflicts are likely to arise on a regular basis due to the opposing views and contrasting opinions in each of these areas of expertise. In some ways I tend to think of them like two candidates in a political race representing the same party. Each candidate has a mutual respect for one another but they both want their opinions to be heard and people to follow their train of thought. As a creative I do respect usability and more often than not try to apply some of their core principles to my own work. However it becomes extremely difficult when you encounter a usability expert who begins to try and influence your own creativity and decisions which you believe to be correct. Unfortunately in some circumstances this can lead to rivalry and aggressive arguments about who is right and wrong. It’s fair to say that neither are particularly productive. Being innovative is extremely important when trying to break away from the mould that shapes the web. For example when working on the Geocube project I wanted to define a new way of navigating a website using an interactive 3D cube. Although in some ways this was like throwing the usability book out of the window I felt it was right for this particular project as it would encourage the user to explore the subject area rather than just interact with yet another website. Had I followed the usability route I could have just created a simple set of pages with links and a few images. Just like every other website on the web with similar content. How boring would that be? It also would not achieve the primary goal which was to stimulate interest in Geography and encourage exploration. However sometimes as designers we tend to over indulge in the aesthetic look and feel of a design which can compromise how usable it is. Great usable design is not just about using the latest photoshop techniques, it’s about designing with a purpose and a reason. In conclusion it’s always difficult to find a compromise in situations where experts are stepping on each others toes, particularly when it comes to very subjective topics like design. What’s important however is that we must strive to be innovative but at the same time not lose sight of our target audience and how they will ultimately use our designs. 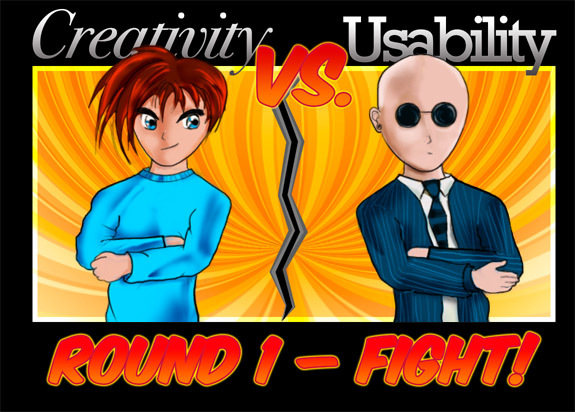 Do you feel usability is more important that creativity? Or perhaps you think both are of equal importance? Comment and let me know.